Many store owners have different set of requirements while setting up an online store site. nopCommerce offers a variety of features that are common to majority of store admins but sometimes a little changes / modifications are required in order to fulfill a requirement. Some store admins rely on the communication with the customers on daily basis and contact us plays a great role in the daily communication. Today we are going to discuss the process of changing the default contact us confirmation message in nopCommerce. 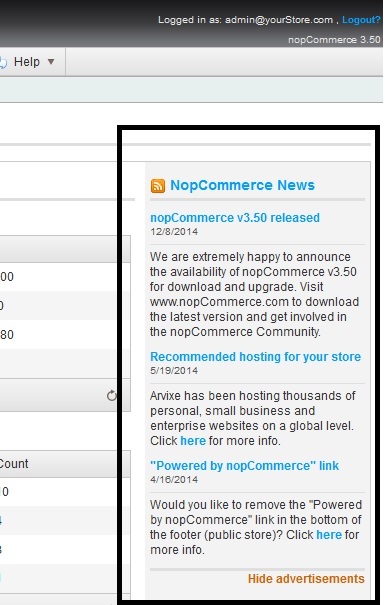 Many times when developers are working on any nopCommerce based websites, they like to remove the nopCommerce site news feed from the administration dashboard before delivering the project. Today we will discuss, how to remove this news feed in the code. All these emails are basically common message templates that are saved in the database and they are being used repeatedly for different customers (simply using their account information). How these emails are sent out? Well, the email address (SMTP) saved in the email accounts setting in nopCommerce is usually used by default for sending out these kind of emails. What if a store owner do not want to use same email address for all these emails and would like to have different emails accounts for various message templates? nopCommerce provides an option to accompish this. Today, we are going to discuss how to use different email accounts for message templates in nopCommerce. Previously, if a store owner / admin had to add a list of states for any country where they would like to sell their products / services, the only way to accomplish that was adding each state one by one. Yes, the process have always been quite tedious and time consuming as there was no other way to add number of states in nopCommerce out of the box. nopCommerce 3.50 is just released and a feature has been added in the administration section which allows store owners to import a list of states for any country. Today, we will be going over the process of importing number of states for one or more countries.